They bite harder, and they progress, but they are still lost. If they indeed are lost, then I certainly wouldn't mind being there with them. This is Iron Maiden's logical successor to Powerslave in more than one way. They bring back some of the fiery luster they had in their early days, and implement that with natural sound progression and more complex tendencies. 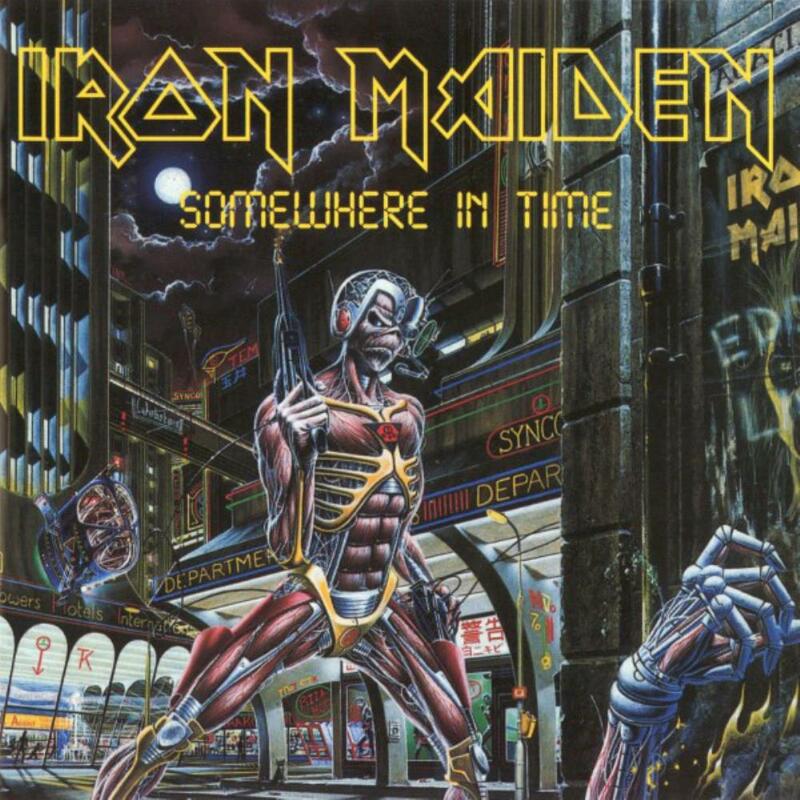 Caught Somewhere In Time just absolutely rips. those dancing and flailing guitar lines are epic and tasteful, not to mention wild eyed and vitriolic. The furious level of power exhibited here is quite the breath of fresh metallic air. Wasted Years is another "instant classic". the well known opening guitar notes, leading into the main heavy rock of the piece. The screeching roar of before is toned down, but Iron Maiden are able to reach a fine middle ground, complete with catchy chorus, too. Sea of Madness picks things back up, and we are off on another grand romp. The rhythm playing is very tight and focused. You can feel the dark symphonic atmosphere that has been injected into the tracks, and the album as an entirety. Noticeable is the embrace of more complex structures and mystic sound, in general. Each song feels at least somewhat more unique than the filler from their last couple of albums. They certainly raise the bar for themselves. Still, unimpressive and average pieces like Heaven Can Wait bloat the album and slow down the process of entrancement. They don't ever let the steam go for too long, though. Loneliness, and its somber melancholy guitar lines bring us back to the forefront. They thrash about accurately, and Bruce gets better with each new album, vocally. Stranger In A Strange Land is intimidatingly staggering in its low end atmospheric swagger. This song has a lot more personality and identity compared to their "filler" songs. The keyboards certainly don't negatively impact the music, and add a drenching epic wash over the eerie work. Deja Vu begins with a downtrodden guitar solo before the song becomes what I call another faceless Maiden tune. It is good, but I am left unaffected and unimpressed. The last song is the most unique of the ones, here. It has the most progressive sensibilities, and rocks the hardest, overall. Bruce is venomous, and Alexander The Great never lets down. A fitting end to a strong effort. The album is a good new direction for Iron Maiden, and they try consolidating their mass sprawling style base into one cohesive work, and sits well as a sign of things to come in the very near future. Still, there are a few filler spots, as with most Iron Maiden releases, crafted in their trademark faceless trot, and their writing hasn't fully revived itself, yet.